Share the post "Lantana Or Shrub Verbena: Love It Or Hate It Plant"
Lantana is a beautiful, easy to grow garden plant in the verbena family, Verbenaceae. It has beautiful colorful flowers that are very tropical-looking and attract butterflies and hummingbirds. The flowers typically change color as they mature, resulting in inflorescences that are two- or three-colored. Lantana is a tough, drought tolerant, long blooming plant. Lantana is commonly found along roadsides, fence rows, and in fields in Florida and southern California where it escaped cultivation. In the northern U.S., it is strictly a garden and greenhouse annual. Most of the plants sold as lantana are either Spanish flag (species of section Lantana and their hybrids, including Lantana camara, Lantana depressa, Lantana hirsuta, Lantana horrida, L. splendens, L. strigocamara, etc. ), or trailing lantana, which gives blue (or white) flowers all year round (Lantana montevidensis). Some species are invasive, and are considered to be noxious weeds, such as in South Asia, Southern Africa and Australia. In this article we’ll talk mainly about Lantana camara. Gardeners either love or hate this plant. Really comes to mind a saying: “one man’s weed is another man’s flower” 🙂 Seems, those below USDA zone 8 love it and those south of it (especially in Florida) find it to be a pest. In many areas it has become an invasive species and established itself as a notorious weed. But it is not invasive north of zone 8 and is considered a perennial only from zone 8 and south. 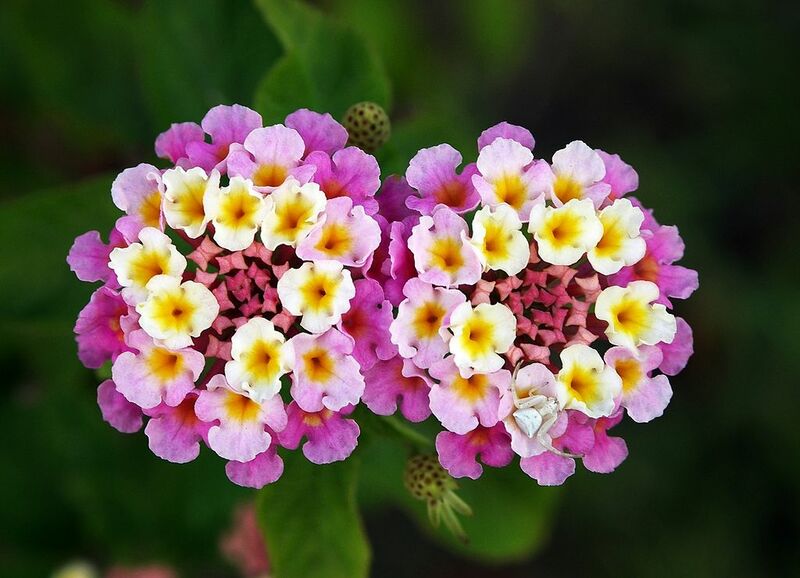 Lantana camara flowers come in many different colors including red, yellow, white, pink and orange which differ depending on location in inflorescences, age, and maturity. After pollination occurs the color of the flowers change (typically from yellow to orangish, pinkish, or reddish), this is believed to be a signal to pollinators that the pre-change color contains a reward as well as being sexually viable, thus increasing pollination efficiency. Lantana camara can survive in a wide range of climatic conditions, including drought, different soil types, heat, humidity and salt. This is a perfect plant for very hot porches and decks that have full sun. Flowers look fresh even in the long days of summer, when nothing else is blooming. 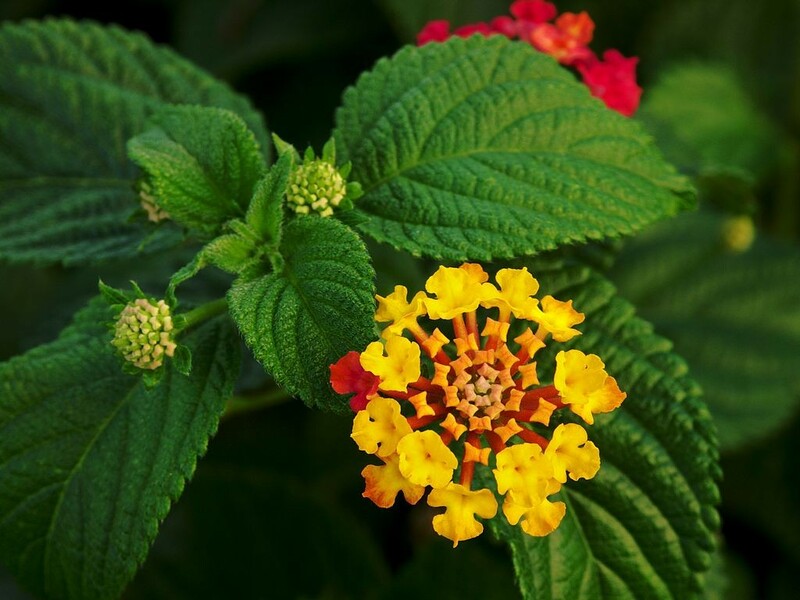 If you decide to grow Lantana in your garden, make sure you know that this plant is poisonous. Foliage and ripe berries contain the toxic substances with the toxins being in higher concentrations in the green berries. Cattle, sheep, horses, dogs, guinea pigs, and rabbits can be affected if they eat the plant. Lantana berries look like blackberries so warn small children NOT to eat them (read more about Lantana’s toxicity below). In spite of some negative reviews, many gardeners love this plant and grow an old fashion Lantana in their yards and gardens, just like my Grandma and other country folks use to have. The old wild variety have flowers with multiple colors and called “Ham & Eggs” as it has the same colors that can be found when staring into a plate of ham and eggs. 🙂 That is the only name you could hear the old country people called this bush. The main uses of this plant have historically been medicinal and ornamental. Studies conducted in India have found that Lantana leaves can display antimicrobial, fungicidal and insecticidal properties. L. camara has also been used in traditional herbal medicines for treating a variety of ailments, including cancer, skin itches, leprosey, rabies, chicken pox, measles, asthma and ulcers. Extracts from the plant have also been used to treat respiratory infections in Brazil. Interesting facts: The Soliga, Korava and Palliyar tribal people of the MM Hills in southern Karnataka, India use lantana to produce roughly 50 different products. It is considered a “near match” to highly priced alternatives, cane and bamboo. Furniture made from lantana is resistant to sun, rain, and termite damage. Native: tropical Americas and West Africa, but exist as an introduced species in numerous areas, especially in the Australian-Pacific region. Plant type: Shrubs or Trailers. Annuals, Tropicals and Tender Perennials. A tender perennial treated as an annual in colder climates. Soil: Sand, Loam, Mildly Acidic, Neutral, Mildly Alkaline, Well-Drained. Moisture: Average Water Needs. Once established, lantana is fairly drought-tolerant. Fragrant: Flowers have citrus-sage scent. To some gardeners a scent similar to that of a passionfruit. The purple variety smells a bit like lilacs. Leaves have a spicy smell. To some gardeners leaves smell as a mixture of mint and camphor with a touch of onion. Others report that leaves have an unpleasantly strong odor, kinda like a foul scent. Propagation: From herbaceous stem cuttings. It is considered more difficult to start from seed. Uses: Bedding, Containers, Fencing, Xeriscaping, Hanging baskets and planters on the patio, Groundcover, Honey plants, Butterfly Gardening, Mailbox Garden. Fertilizer: You can feed them Osmocote if have problems with blooming. Invasive: Yes. Lantana is considered damagingly invasive to natural areas in Florida and Hawaii. Considered a weed in parts of Australia. The World Conservation Union IUCN has included this species on their list of 100 of the world’s worst invasive species, an honor it shares with only 31 land plants. Has Thorns: Fine spines on the leaves and stems can pierce the skin and cause irritation. Use gardening gloves when working with the plant. Toxicity: All parts of plant are poisonous. The unripe fruit is toxic to humans. The foliage, seeds and fruits are toxic to many animals, including dogs if ingested. Lantana causes dermatitis in some individuals. Be sure to wash your hands after handling. Use gardening gloves. 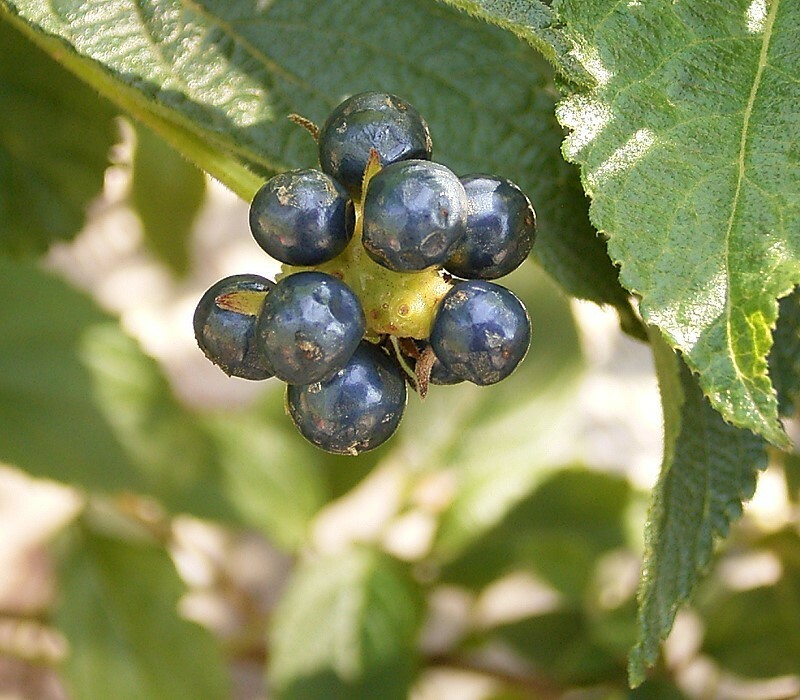 West VA State University web site states: This ornamental shrub contains lantanin, a triterpenoid, and other compounds irritating to the mucosa of the gastrointestinal tract. All parts of the plant are quite toxic and poisoning may occur year-round, but is most common in summer and fall. Many poisoning cases occur when clippings are thrown into the pasture. Lantana species, especially L. camara, contain pentacyclic triterpenoids that cause hepatotoxicity and photosensitivity when ingested by grazing animals such as sheep, goats, bovines, and horses. This has led to widespread livestock loss in the United States, South Africa, India, Mexico, and Australia. • Once established, the plant will die to the ground after frost but recovers quickly every spring. • Lantana does like to drop seeds. You will get a colony if not well monitored. • The Native Florida Lantana is Lantana depressa. Suggestions to grow the much better behaved native Lantana depressa, or the non-native but easily controlled Lantana montevidensis in Florida instead of Lantana camara. • A good pot plant for the summer months in the UK. I also grow in the greenhouse as a nectar plant for butterflies. • Most flowers change color as they age. • Good to plant where nothing else will grow. They can tolerate sandy soil and little water. This plant is heat-resistant, drought resistant, bug resistant deer-resistant, and vigorous. • Cut it completely back to the ground in the fall after frost. It comes back strong and beautiful. • Prune it during it’s growing season, just to keep it from getting too leggy and wild-looking. • Tolerates well if to move it around or dig up and re-plant new plants that have seeded on their own. • The plant must be deadheaded regularly in order to keep blooming and this better be done with gloves as touching the plant causes allergic reactions. Do you grow Lantana (Shrub Verbena) in your garden? What is your experience with this plant? Please share with other fellow gardeners in the comments below! Do you sell Lantana (Shrub Verbena) seeds or have plants for sale? You can place your advertisement here. Contact us now! Your hardiness zone in South Alabama is 8a or 8b. So, in general Lantana should grow ok over there. Maybe there is a problem with the soil, and together with lots of rain it created not favorable conditions for Lantana growth. The soil should drain freely. Too much water can create boggy conditions if soil is not loose. This may lead to root rot and other problems. Lantana needs full sun and that means at least six hours of full sun, eight or more is even better. What kind of variety have you got? “Ham and eggs”? yes the real pretty colors and it was in the hot sun.It just turn brown and died.I had the big one last yr and it was beautiful.It had a huge bundle of roots on it .It put out one green leaf branch and then it turn brown.so i dont know i put the last one on the upper hill in the sun I think it is just to much humidty. When I was 7 year old, me and friends use to eat fruits of this plant as well as the flowers while coming from school in Delhi, India. These small berries were really sweet in taste and black in color. I do not remember the taste of flower. But now I am 30, and still feel fine. I do not think that it harm me in any way. I read a journal article in Tanzania that used Lantana Camara as a mosquito screen around the entrances to houses in a village to see if there was a reduction of mosquitoes inside the houses (leading, hopefully, to a reduction of malaria). Even with the many variables, most households and house sizes were similar with unscreened windows and doors. The only real variable was that some homes kept animals indoors which increased the warm blooded “beings” in those houses. But, overall, the mosquitoes inside were reduced from 50-75%. So Floridians should consider before cutting down this plant beneficial plant.